How to Preview Backup File with .bak Format? Home > Resources > Others > How to Preview Backup File with .bak Format? Creating BAK file has been set up as the fault configuration of many software, especially the programming, drawing, and design software. The advantage of it is that when the source file is accidentally deleted or when the software automatically exits due to the software's own bugs, you can also continue editing on the basis of the backup file. Otherwise, the previous sweat can only be lost, which reduces the loss caused by many misoperations. So what is BAK file exactly? How to open and preview BAK file? Please read on to get more information about it. Part 1. What is .bak File? Part 2. How to Open & Preview Backup File with BAK Format? Part 3. How to Restore & Preview Backup File with BAK Format? Part 4. How to Create A .bak File? BAK is a file extension for a specific file format, which is generally used as a backup file or a copy of another file. Specifically. the .bak file can be created by automatic backup when the application is edited, overwritten, etc. as part of the autosave process. For example, it happens when a program or application is updated, and you can choose to turn off automatic backup in the program as needed. Besides, the BAK file can also be created by many programs, such as Android Manager, Phone Transfer and so forth. When you backup your Android messages or contacts to your desktop computer, you can select ".bak" as the target format. To better understand, you can connect the BAK file and other other format files. For example, the .doc stands for Word documents and .xls is excel spreadsheet format. It is for the same reason that .bak stands for backup file. So, if you want to know where to look on someone else's computer to see if their information is already backed up, you may want to look in their desktop or laptop computer to obtain this information. Now, you probably have known that many files can be saved as BAK files even though you have not noticed them. You can also manually add a .bak file extension to create a BAK file by yourself. However, please be aware that the .bak file cannot be opened without any settings. So if you want to open a .bak file on your desktop computer, you can do the following by following the instructions below. In general, you can open a .bak file by changing the file extension. For example, if the bak file is a backup file of an MS Word document, you can change the extension from .bak to .doc or .docx, and then you can use MS Word to open the bak file. Similarly, you can easily open a bak file by changing its extension to .dwg, .jpg, and so on. However, what is worth mentioning is that if the bak file is encrypted, this solution may not be useful here because you will only see a mess in the file. In addition, if you don't know what the original program is, you need to find an app to help you open it for previewing. Here, the Free File Viewer is recommended here for your reference, which allows you to open and view up to 200 types of files on your desktop computer as needed. Now that BAK file is possibly generated by Android Manager and transfer tool, if you want to see the information in a .bak file extension, you can use the same software to open and preview the .bak file. For instance, if the .bak file was created when they user used the Android Manager, the BAK file can also be opened and reviewed by the user with the Android Manager. Here in this part, this article will show you how to use the Android Manager program to help you create, restore, open and preview a BAK file. It is a safe and easy-to-use Android data manager, which provides Android users with the convenient Android data managing, backup & restore solutions. First of all, you should download a suitable version according to your computer's operation system. Step 1. Simply run the Android Manager after you installed it, connect your Android device to the computer with USB cable. For the first time you have your Android connected to this computer, please enable USB debugging on your device as prompted, making it successfully recognized. And you now can see the primary window of program. Just click "Super Toolkit" from the top menu. 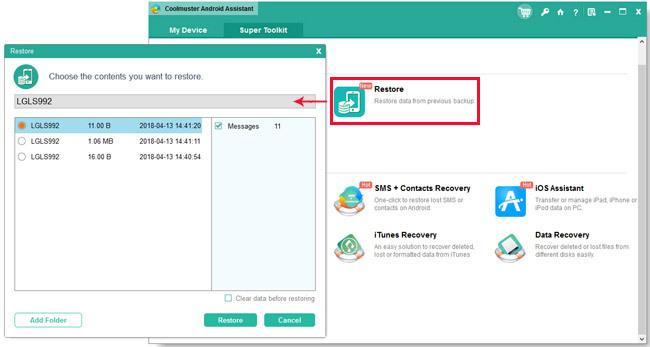 You can even click "Restore" button to restore the BAK backup file and save it to your Android device. To create a BAK file is to create a safe backup of your important file. So how to create a BAK file of Android data with Android Manager? You have 2 ways to make it as follows. Download the Android Manager at first if you haven't. After making your Android phone recognized by Android Manager successfully (such as Step 1 in the last part), you can choose either way of the follows. - Go to "Super Toolkit" section and hit "Backup" option. - Choose your Android phone and choose the files you want to backup, such as contacts, apps, call logs, text messages, music, videos, photos, books. - Click "Browse" to choose the location where you want to store the backup file on computer, and click "Back Up" button to complete the process. Thus a BAK file that contains the files you have selected will be saved on computer. When you need to preview it, use the above way to do so. - Go to "Contacts" or "SMS" tabs on the main interface. - Tick off one or more contents you want to backup. - Click "Export" > "Export to BAK File" to save them to computer as a .bak file. Tips: You can backup Android SMS as HTML for printing if you need. How to Transfer vCard (.vcf) to Android Phone? How to Save HTC Phone Contacts As HTML File?